Earlier this month I posted my Pig Pralines recipe and I promised that they would be used in ice cream. Well, the time has come and here it is. This is a serious experiment in porcine dessert indulgence. 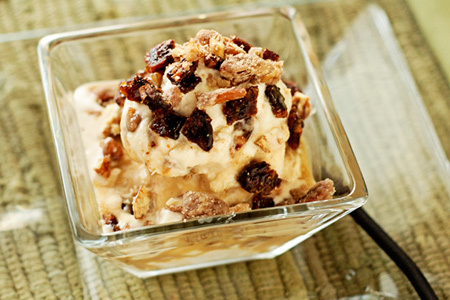 It's rich and creamy homemade vanilla ice cream with tidbits of pig candy and bacon-infused pralines riddled throughout. The savory, sweet and slight spiciness of the bacon are magical with the cool creaminess of the ice cream. For the ice cream I used my old-school White Mountain ice cream maker and a really simple no-cook (some may say cheater) base recipe. You can use your favorite recipe in whatever ice cream maker you have. Combine the cream, milk, condensed milk and vanilla in a large mixing bowl and whisk well until all of the ingredients are completely incorporated. Cover and refrigerate. Prepare your ice cream maker and freeze the ice cream per the instructions. 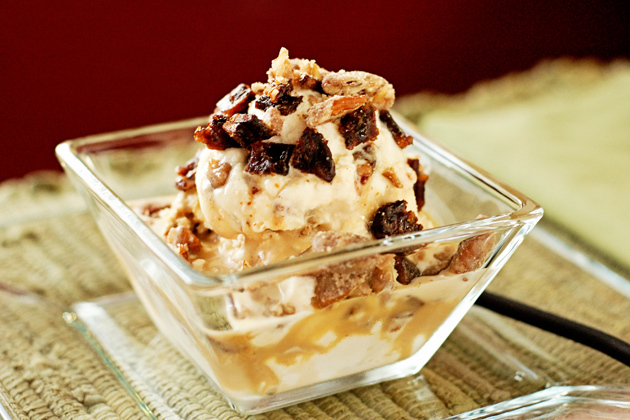 Gently fold the bacon and pralines into the soft ice cream and freeze in an airtight container until it hardens (3-4 hours). Serve and enjoy! I served mine with a drizzle of a homemade maple caramel and some additional chopped bacon and pralines. This looks so good!!!! Can't wait to make it. Thanks for sharing!!! This icecream looks totally indulgent. Love sweet and salty. This reminds me of a salty caramel and bacon gelato that I had Monday night at The Inn at Versailles. It was the best dessert I have ever had in my life. I'll have to give this a shot.